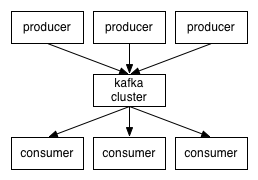 Download kafka_2.11-0.8.2.2.tgz and extract to each node. If you don’t have Zoopkeeper running in your cluster, don’t forget to lauch Zoopkeeper before starting Kafka server. I developed a simple log generator web service with Node.js, you can clone the repo for a quick demo. For more details about this repo, please check the document here: https://github.com/HaohanStacks/haohan_data_producer. In node2, logs will be generated in ./generator/logs/access.log. Now we need to send this log content to Kafka Server. Pay attention to the path of log file and binary files. 192.168.6.18 is node1’s ip address, haohan is the topic of this producer. Now we have pushed logs to Kafka Server. 2181 is the default port for zookeeper, pay attention to the topic name, it should be the same as what you have named when you setup the producer in node2. Open another terminal, send http request to your web service (This web service is launched by Node.js, the default port is 3000).